Barcelona vs Real Sociedad Live Streaming Online: How to Get Spanish La Liga 2018–19 Match Live Telecast on TV & Free Football Score Updates in Indian Time? Juventus vs Fiorentina, Italian Serie A 2018–19 Live Streaming and Telecast Details: Where and When to Watch JUV vs FIO Football Match Live on TV and Online? Xiaomi has finally launched the new Redmi 7 smartphone in the home market today alongside the Chinese variant of Redmi Note 7 Pro. The newly launched Redmi 7 smartphone comes with massive upgrades, dot-notch, new gradient design and much more. The Redmi 7 phone comes in three variants (2GB, 3GB & 4GB) whereas Redmi Note 7 Pro is launched as a sole variant with 6GB of RAM and 128GB internal storage capacity. 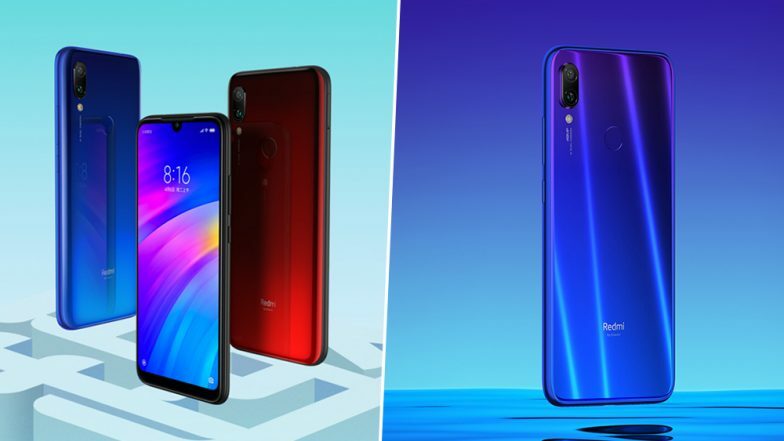 Moreover, the new smartphone from Xiaomi is rolled out under the new Redmi sub-brand similar to Chinese version of Redmi Note 7. Redmi Go ‘Xiaomi’s Cheapest Smartphone’ Launching Tomorrow in India; Likely to Be Priced Below Rs 5000. The Redmi 7 prices commences from CNY 799 whereas the Redmi Note 7 Pro costs CNY 1,599 in China. On the specification front, the Xiaomi Redmi 7 comes powered by Snapdragon 632 processor, 6.26-inch Dot Notch display and 4000mAh battery. The phone packs a dual rear camera module at the rear featuring a 12MP primary and a 8MP secondary sensor. The Redmi 7 is offered in 3 exciting shades - Blue, Red, and Black. On the other hand, the Chinese version of the Redmi Note 7 Pro features impressive specifications. It gets 6.3-inch HD display and the same 48MP rear camera setup as seen on the Indian version. Under the skin, there is Qualcomm Snapdragon 675 SoC that is clubbed with 6GB of RAM and 128GB of internal space. Moreover, the device also features 18W fast charging option. Both the devices carry P2i nano-coating waterproofing. Coming to the pricing, the base variant of the Redmi 7 - 2GB RAM and 16GB ROM costs CNY 699 (around Rs 7000). The mid variant with 3GB RAM and 32GB ROM is priced at CNY 799 (around Rs 8000), while the price of the top-end model - 4GB RAM and 64GB ROM is CNY 999 (Rs 10,000). Currently, there is no official word regarding the India prices of the smartphone. The Redmi Note 7 Pro is priced at CNY 1599 for the 6GB of RAM and 128GB internal storage version. The device is slated to go on sale in the Chinese market from March 22.